One of Houston’s Most Accessible Neighborhoods, Midtown is a short MetroRail ride from major job centers, including Downtown & Texas Medical Center. GREAT ACCESSIBILITY: One of Houston’s Most Accessible Neighborhoods, Midtown sits along major freeways (Gulf and Southwest) and near major roads (Main Street, Alabama Street, and Fannin Street). The Red Line runs through the neighborhood, providing easy METRORail access to key neighborhoods north and south of Midtown. 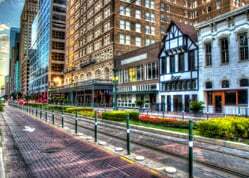 PROXIMITY TO JOB CENTERS: Downtown Houston has more than 150,000 workers employed by 3,500+ businesses. Texas Medical Center is the largest medical center in the world with over 8 million patients and 100,000+ employees. Midtown residents can reach either with a 5-minute ride via MetroRail, Uber or a bike. EXCITING ESTABLISHMENTS: Midtown is home to over 340 Yelp-rated establishments including top ranked restaurants, gyms, bars, diners, and shops. 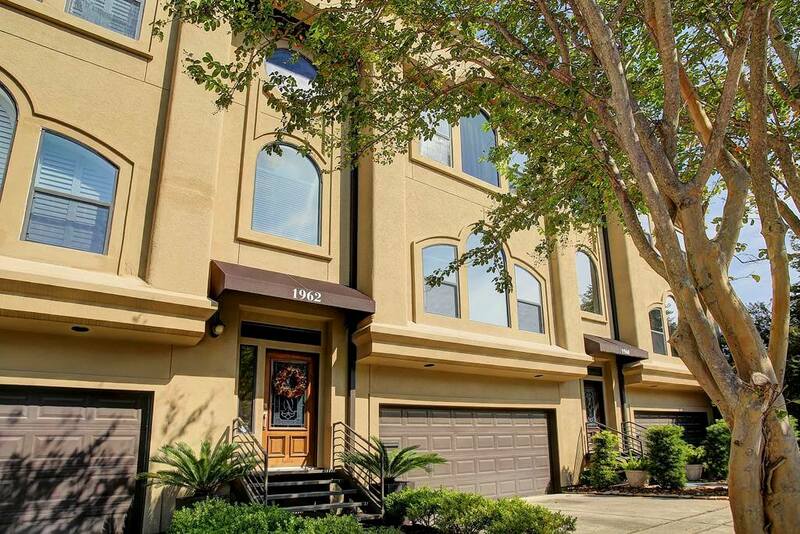 AFFORDABILITY: Midtown is one of the most affordable areas of Houston’s Inner Loop. View the Salary Requirements to Live Comfortably In 52 Top Ranked Houston Neighborhoods. Buying or selling a home in Midtown can be tricky. Be cautious of buying a midtown home that is too close to a freeway (hurts resale), is on a major thoroughfare (noise/street parking can be an issue), or is located in the “parking area” for one of the hip nightclubs. It’s also important to know there’s no zoning (some homes are built backing a bar/restaurant), and several new construction builders have been sued for quality concerns. Condos in Midtown can also present unique challenges, as some have lower resale values and quality concerns. 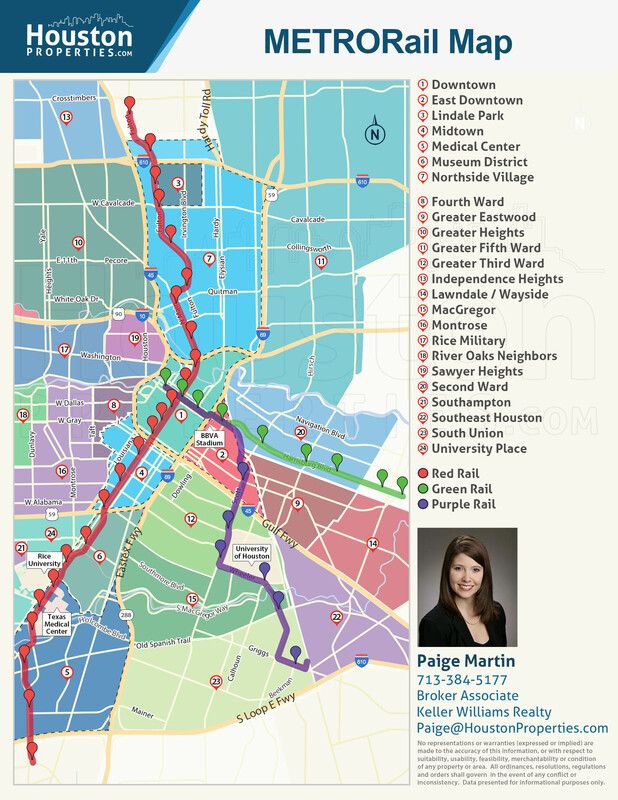 For help in navigating this challenging market, contact Paige Martin, one of Houston’s Best Realtors and one of Midtown’s most active real estate agents. Enter your email to get this free Midtown guide in easy-to-read PDF format. Bonus: Also see how this area compares with nearby top neighborhoods. 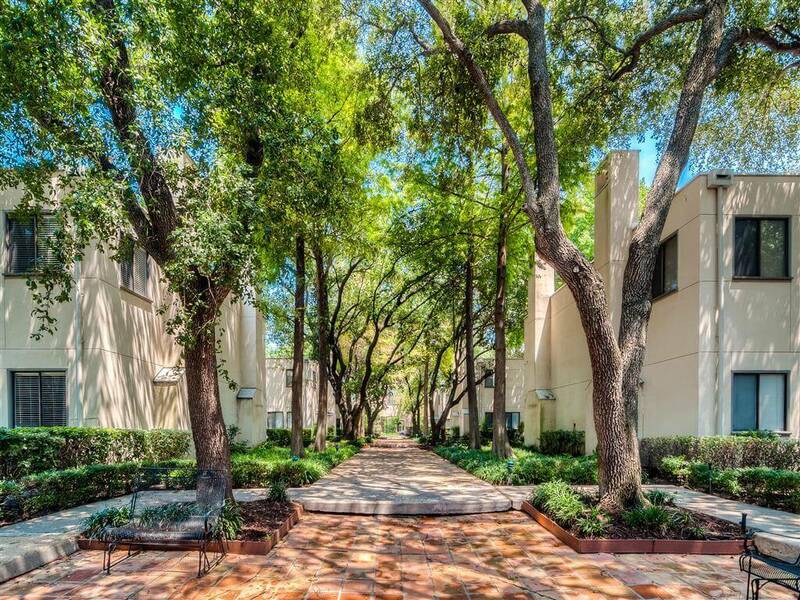 Nestled adjacent to Houston’s central business district, Midtown is one of the city’s most accessible neighborhoods. 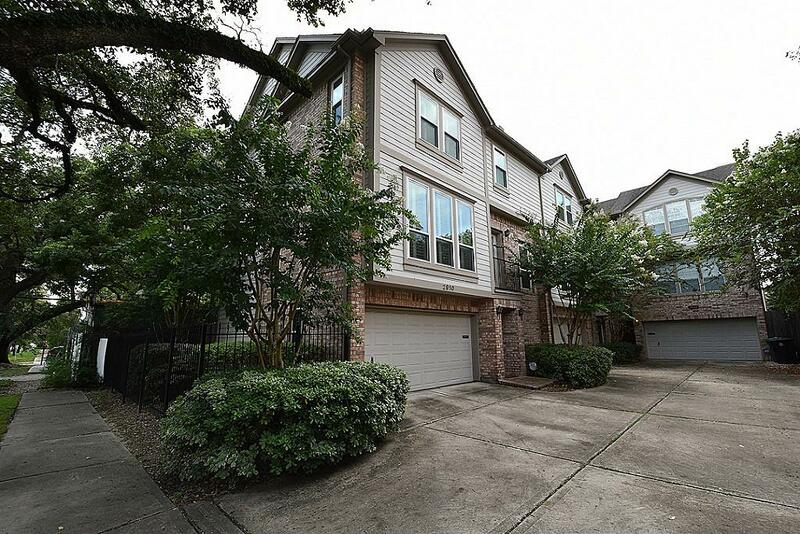 The neighborhood is minutes away from key Houston districts like the Galleria/Uptown area and the Museum District. Midtown lies along major freeways, including Gulf and Southwest Fwys. Major arteries like Main Street and Alabama Street run through the neighborhood. Located a stone’s throw away from Houston’s central business district, Midtown homes have excellent access to major employment centers, like the Texas Medical Center and downtown. Midtown features a wide assortment of affordable home options, including townhomes, condos and lofts, patio homes, and single-family dwellings. Thanks to the neighborhood’s vibrant street scene, Midtown homes are mere minutes away from restaurants, bars, lounges, coffee shops, boutiques, and retail stores. Midtown is still in the midst of redevelopment. The neighborhood saw a decline in the 1980s and 90s, however, an injection of funds from the Midtown TIRZ has made renovation efforts possible. Midtown homes are zoned to the Houston Independent School District (HISD). Townhomes are the main housing option in the neighborhood. Midtown townhomes typically feature 2- to 4-story floor plans with 3 to 4 bedroom options. Homes in the area typically sit on small lots, with sizes ranging from 1,000 to more than 3,000 square feet. Home sizes can range from 1,500 to more than 3,000 square feet. Midtown condos have also become a popular housing option. Residential buildings in the area include Rise Lofts, 2016 Main, The Edge, and Midtown Vistas. Some condo buildings in the neighborhood feature private balconies with downtown skyline views, fitness centers, rooftop decks with swimming pools, and reserved parking for residents. Prices for Midtown homes for sale can range from $100,000 to more than $900,000. Location is easily Midtown’s best asset. 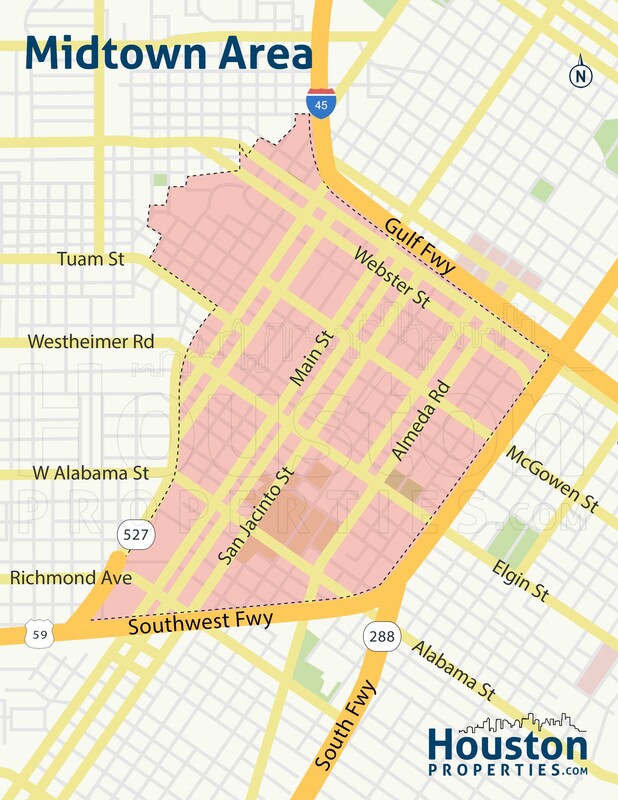 The neighborhood has Downtown to the north, Montrose/Neartown to the west, East Downtown (EaDo) to the east, and the Museum District to the south. One of the most accessible neighborhoods in Houston, Midtown is along Southwest/South Freeway (Interstate 69/Highway 59) and Gulf Freeway (Interstate 45). Homes in the area have comfortable access to job centers like the Texas Medical Center, as well as retail and entertainment hubs like the Galleria, Rice Military, and Montrose. Apart from having direct access to major freeways, Midtown also has excellent transportation facilities. The METRORail Red Line runs through Midtown’s Main Street, with three stops: Wheeler, Ensemble/HCC, and McGowen. The district houses Houston’s intercity bus station and has access to the city’s bus routes. Like its eastern neighbor EaDo, much of Midtown is undergoing redevelopment and new construction is a common sight in the area. The neighborhood is a mixed-use district, with plenty of restaurants, bars, and coffee shops minutes away from Midtown homes. Henry F. MacGregor Elementary School at 4801 La Branch St. Serving PK to 5 students, MacGregor offers several magnet programs in music and science. It also offers an Extended Day Program. Young Scholars Academy for Excellence at 1809 Louisiana St. Young Scholars is a public charter school that serves PK to 8 students. It offers programs that are family-centered and focused on children’s holistic development. Lamar High School at 3325 Westheimer Rd. Home to the Lamar Texans, this high school offers one of the best athletics programs in the city. Lamar also has one of the oldest lacrosse programs in Texas. Apart from its athletics, Lamar also offers excellent academic programs. It is an International Baccalaureate World School with a Diploma Programme and a business administration magnet school. Houston Academy for International Studies at 1810 Stuart St. This alternative secondary (magnet early college) school was awarded the National Blue Ribbon School of Excellence in 2014. It offers academic programs like Advanced Placement and Early College/Dual Credit. Young Women’s College Preparatory Academy at 1906 Cleburne St. A result of a partnership of the Houston ISD and the Young Women’s Preparatory Network, YWCPA offers Pre-AP and AP courses for grade 6 to 12 students. The following are some of the more notable private schools near Midtown. Imagination Campus Midtown at 2000 Crawford St. This private early education school caters to infants, toddlers, early- and pre-school students. Imagination offers unique programs in child development including Sparks I and II. LaBranch Child Development Center at 2320 LaBranch. Located at the LaBranch Federal Building, this center also offers child care and early education programs. Precious Jewels Alpha Learning Center, LLC at 2301 Main St.Precious Jewels is a private school serving PK-6 students. It offers extracurricular activities in fine arts, including music and creative movement. The School For Young Children at 810 Sul Ross St. This school is under the Special Schools Coalition of Greater Houston and serves grades 1-6 special needs children. They specialize in providing elementary education to children with language-based learning difficulties. The Harris School at 900 Lovett Blvd. This school offers a specialized curriculum for students in grades PK to 8. The curriculum centers on academic and therapeutic programs. Incarnate Word Academy at 609 Crawford St. The Incarnate Word Academy is a “Catholic college preparatory for young women.” IWA offers both academics and athletics programs. St. Stephen’s Episcopal School at 1800 Sul Ross St. A part of the Episcopal Diocese of Texas, St. Stephen’s is a diverse, coeducational school. It serves grades 6 through 12. 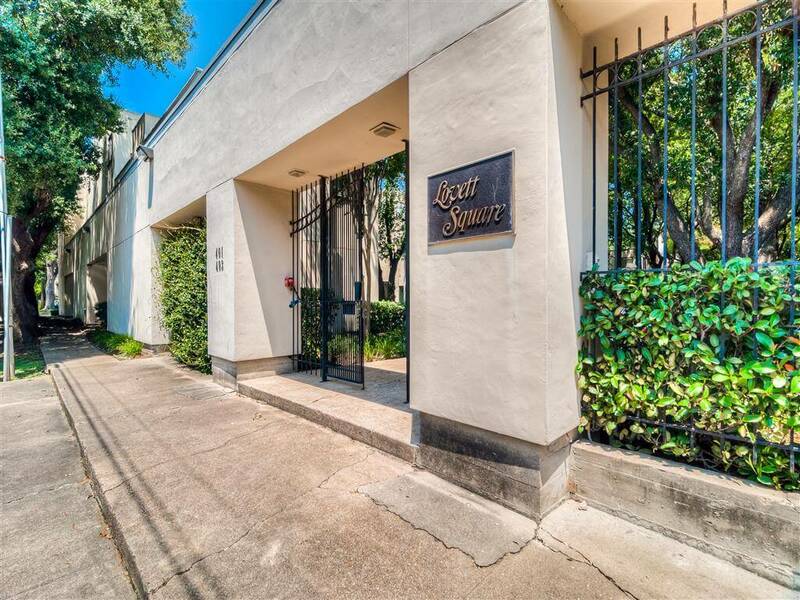 To find an updated listing of all Midtown real estate zoned to any specific public school, please send an email to Paige Martin at Paige@HoustonProperties.com with the property preference and budget that you’re working with. Midtown real estate have posted steady appreciation rates over the past decade, with the median sales price passing the $300,000 mark. A number of factors may have attributed to the neighborhood’s strong property prices, including the area’s central location, new commercial and residential development, and high accessibility. As a newly revitalized mixed-use neighborhood, the most popular Midtown housing options are townhomes and condos. New construction multi-level townhomes are common in the area, ranging from contemporary and traditional styles. Compared to similar properties in the Inner Loop, Midtown homes for sale are relatively cheaper, with prices starting at $100,000. Midtown has some of the most affordable prices per square foot in the Inner Loop. Townhomes in the area averaging 2,000 square feet can sell for $400,000. 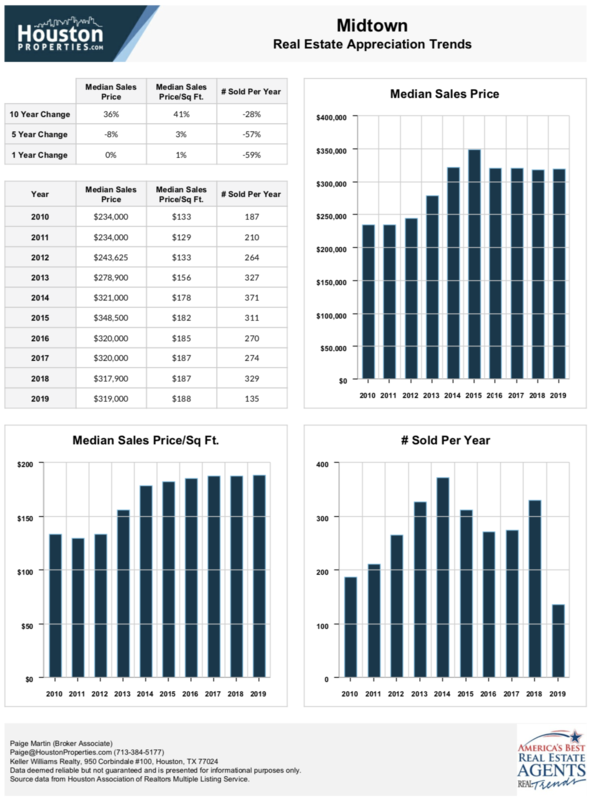 For updated information regarding Midtown real estate pricing and trend analysis, please contact Paige Martin at Paige@HoustonProperties.com. Following a trend of new construction townhomes, the number of Midtown single-family homes for sale have decreased. Many of Midtown’s older homes have been replaced with patio homes. These usually sit on small lots with 3-bedroom, two- to three-story floor plans. Home sizes can range from 2,000 to more than 4,000 square feet. Midtown homes feature lots ranging from 1,000 to about 3,000 square feet in size. Some of the most expensive Midtown real estate properties are mostly new construction homes featuring as many as 4 bedrooms. Townhomes have revitalized the Midtown real estate market. Having replaced most of the area’s older homes, new construction townhomes are the main housing attraction in the neighborhood. Midtown townhomes for sale typically have 2- to 3-story, 3-bedroom floor plans. Second- to third-floor living, 3 bedrooms, 3 and a half baths, and 2-car garages come standard. Most townhomes in the area are located within small gated communities. Amenities within these communities can include 24-hour security and controlled access. Midtown townhomes typically feature 2,000 to more than 3,000 square feet of living space. Lot sizes can range from 1,500 to about 3,000 square feet. Pricing for Midtown homes for sale can start at around $300,000 to upwards of $800,000. Loft living is popular in the district. A number of Midtown luxury lofts, like the Rise Lofts on 2000 Bagby Street, offer views of the Downtown Houston skyline, open floor plans, and great accessibility. Midtown condos typically offer 1- to 2-bedroom floor plans. Many feature 1,500 to 2,000 square feet of living space with 2 parking spaces and access to great amenities like lounges, pools, and garden terraces. Pricing for Midtown condos for sale typically start at $130,000. Some units in the area’s luxury condos can sell for more than $900,000. Back in the 1940s, Midtown was one of Houston’s most popular residential districts. The neighborhood flourished due to the Humble Oil and Refining Company, though the surge of commercial establishments in the district led to some residents moving to less busy Houston neighborhoods. In the 1970s, Vietnamese immigrants and Vietnamese Americans established Little Saigon on Travis, Milam, Webster, and San Jacinto streets. The oil production decline during the 80s and 90s hit Midtown hard. The neighborhood saw a decrease in population and an economic slowdown. Boarded-up buildings and graffiti lined the district’s streets. 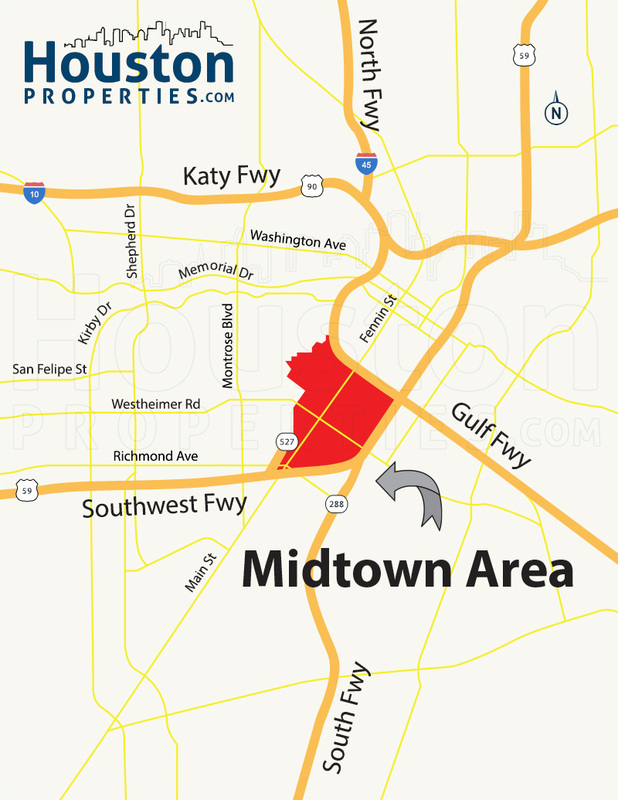 In 1995, Houston established the Midtown Tax Increment Reinvestment Zone (TIRZ). Four years later, the Midtown Management District was born. Redevelopment initiatives effectively increased Midtown’s population, along with condos, apartments, townhouses, restaurants, bars, and retail stores in the area. Today, the neighborhood has distinct street signs, landscaping, lights, and paved sidewalks. Midtown’s resurgence, however, is not over yet. With more and more people moving to the trendy and highly accessible district, more improvements are expected to follow. Thanks to the neighborhood’s active street scene, residents have great options right by their doorsteps. Midtown also has a number of parks within and around the district. Elizabeth Baldwin Park, a 4.88-acre area between Crawford and Chenevert streets, has a Vietnamese Heritage Plaza. Peggy’s Point Plaza Park is also located in the district, while Discovery Green in Downtown Houston is just minutes away from Midtown. Due to the neighborhood’s central location, Midtown homes are also minutes away from Houston’s best retail, dining, and entertainment centers.